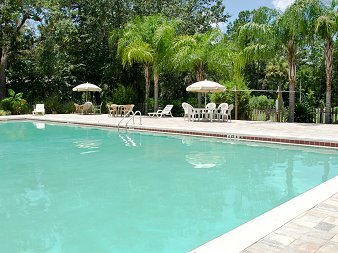 Wilderness RV Resort boasts some of the finer amenities found in today's RV Resorts. Many of our amenities are found in four rustic log cabins that have been renovated with all the modern conveniences. Whether you are looking for entertainment, exercise or even laundry facilities we can accommodate. The Social Hall is spacious enough to accommodate 120 people. We host our larger activities here, such as bingo, dances, cookouts, karaoke and much more. The Lodge is used for smaller more intimate gatherings. We have a big screen TV, book exchange, board games, puzzles and more to enjoy. With a large screened in back porch it is ideal for enjoying the beautiful Florida weather. Our fitness center is equipped with treadmills, an elliptical machine, free weights, flat screen TV's and more. After your workout you can also enjoy the wet/dry sauna, steam room or a shower. Our recreation room is furnished with a pool table, ping pong table, dart board, comfortable recliners and flat screen TV's. Conveniently located by the swimming pool is the bathhouse with private showers and restroom facilities. Our laundry facility is equipped with 8 large washing machines and 8 large dryers. There is also a flat screen TV and snack machine to help pass the time. The Dog Park is a one acre fenced in facility for your dog's pleasure. There is a small spring located in the center of the park and picnic tables for the two legged visitors. In the shade of the oak trees we have horseshoe pits, a bocce ball court and two shuffle board courts. Located on the east side of the resort is a private fishing pond and dock. 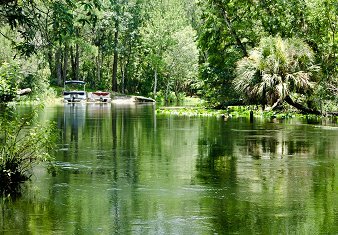 A three mile nature trail leads from the park into the Cross Florida Greenway providing sheltered views of the Ocklawaha River.